Last August, with no fanfare or press release, JM Family Enterprises implemented a $16-an-hour minimum wage for all of its employees. JM — a 48-year-old firm that operates one of only two franchised Toyota distributorships in the country — made the new wage policy effective immediately. Career: Joined JM Family Enterprises in 1992 as vice president and general counsel after holding similar positions at Fuqua Industries in Atlanta and Cannon Mills in North Carolina. Became JM's COO in 1997, president in 2000 and CEO in 2003. Non-Profit Work: On the board of directors for the United Way of Broward County and the Youth Automotive Training Center in Deerfield Beach. Also on the board of trustees for Florida TaxWatch and a member of the Broward Workshop, a non-partisan business group focused on education, the environment, transportation and other issues. As a result, about 400 employees got a raise overnight. Another 600 employees who already made $16 or more per hour also got a raise, maintaining the wage tiers that reflect different experience levels. In all, about a quarter of JM's 4,100-person work force directly benefited from the move. Colin Brown, president and CEO of the family-owned company, which is based in Deerfield Beach, figures the decision will add $6 million to JM's payroll costs over the next 12 months. In 2014, JM had sales of $13.1 billion, making it the 21st-largest privately held company in the U.S.
JM increased its workers' pay at a time when income inequality is sparking a national conversation about what amounts to a fair wage. Labor activists have been calling on fast-food chains to adopt a $15 minimum wage. Health insurer Aetna recently began paying its employees no less than $16 an hour. Walmart is pledging to raise its base hourly rate to $10 this year, and debate continues over whether the federal minimum wage of $7.25 is too low. JM isn't the first or only Florida company to boost wages amid the discussion of fairness. In 2014, C1 Bank in St. Petersburg announced a $14-an-hour minimum wage, a move that raised the pay of 27 employees. CEO Trevor Burgess says he didn't want any of the bank's employees earning less than $30,000 a year. First Green Bank in central Florida subsequently announced a similar living wage policy that affected 11 of the bank's 66 employees. But JM's move is particularly noteworthy because of the company's visibility and standing in the Florida business community, the number of workers involved — and the fact that it didn't face the kind of pressure that usually motivates other businesses to raise wages. David Cooper, who studies income inequality as an analyst at the Eco nomic Policy Institute, a Washington think tank, says it's rare for companies to raise their minimum wages. "More often than not," he says, "it's done as a business strategy or as a result of market pressures" to better compete for quality employees or to turn around bad publicity. At JM, staff turnover, at 6% a year, was already low, and the company had no trouble attracting employees, Brown says. "We get a lot more applications than we have open positions." JM, he says, simply wanted to ensure that its employees — or associates, as it calls them — earn enough to have a "sustainable quality of life. For who we are, we thought this was the right thing to do. And we could afford it." The son of an American diplomat, Brown grew up in Europe and Southeast Asia. He says his childhood made him adaptable to change and widened his viewpoint. "I've seen different living conditions and different environments." At 14, Brown returned stateside and attended Culver Military Academy in Indiana. He got his bachelor's degree at Williams College in Massachusetts and then a law degree at Duke University. "I went to law school never having met a lawyer in my life, and I didn't know what I was going to do after I graduated," Brown said as the featured speaker for a Duke Law roundtable discussion in 2011. In the mid-1970s, he moved to New York to work for a large law firm, gaining experience in a number of practice areas. A professor from his Duke days then persuaded him to move to North Carolina to become general counsel at Cannon Mills. After a corporate takeover pushed him out of that position, he joined Fuqua Industries in Atlanta, where he met a similar fate. "I've worked for three corporations, and I've been fired from two. So I know what it's like to be fired and without a job," he says. "That probably has made me a little more empathetic." In 1992, a friend of Brown's who had worked with JM as a relationship banker encouraged him to look at the company, and Brown applied to be its general counsel, despite knowing "nothing about the car business." The company's founder, Jim Moran, a one-time Ford dealer from Chicago, had gambled in the late 1960s that Japanese imports could compete against the big domestic automakers. Moran developed a relationship with Toyota, and his firm, Southeast Toyota Distributors, became the Japanese automaker's exclusive distributor of new vehicles in Alabama, Florida, Georgia and the Carolinas. 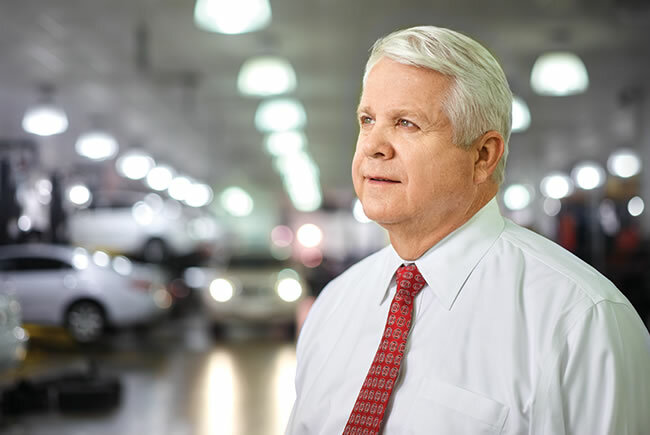 Functioning as a middleman, Southeast Toyota buys the vehicles from Toyota, handles the work of shipping, prepping and accessorizing them, and then resells them to dealerships in the five-state region. Adding financial, insurance and other services to the distribution business, Moran built JM into a financial powerhouse, but Brown arrived at a challenging time. The company was facing lawsuits from dealers claiming Southeast Toyota had forced them to do business with JM subsidiaries. The company also was accused of discriminating against African-Americans in awarding dealer franchises, prompting a congressional hearing in 1992, the year that Brown became its general counsel. Brown settled all the dealer lawsuits, and JM established an annual awards program to recognize African- American leaders in south Florida. Every year, JM Family, Southeast Toyota and JM Lexus donate $40,000 on behalf of the honorees to the charities of their choice. More than $410,000 has been awarded on behalf of 137 African- American Achievers since the program was created in 1992. Brown says that era was "a very unfortunate period of time in the history of the company. I came in and ultimately helped clean it up. But that's ancient, ancient history. There isn't another group that has a stronger relationship than we do with our dealers."